Ignite, Ministry of IT & Telecom has launched DigiSkills program to impart training of one million workforce comprising of youth, skilled professionals and freelancers. 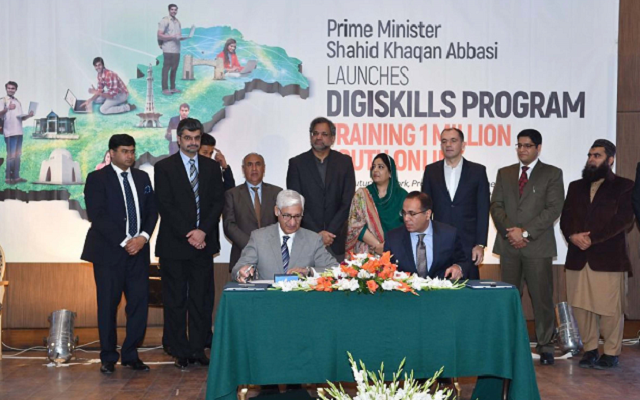 Ignite has awarded DigiSkills training project to Virtual University of Pakistan and PTCL has been selected as partner for this strategic project. PTCL Partners with Virtual University for Ignite’s DigiSkills Initiative. Appreciating and encouraging the initiative, the honorable Prime Minister of Pakistan Mr. Shahid Khaqan Abbasi on the occasion said, “The government is committed to bring economic growth and development of Pakistan, I congratulate Virtual University and thank PTCL for collaborating with VU for this Digital Skills Training Programme under the auspices of our government which would train 1 million people of this country all over the world under the umbrella of ‘On Demand Economy’. This initiative, would not only create employment opportunities, but also provide the nation to contribute for the vision of prosperous Pakistan”.